330 pages | 140 Color Illus. | 43 B/W Illus. 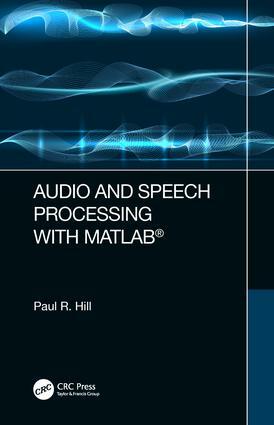 "Audio and Speech Processing with MATLAB is a very welcome and precisely realized introduction to the field of audio and speech processing. The initial chapters give numerous, novel and well-organized insights into the background of the subject. The combination of engineering, mathematics and perceptual analysis of the audio processing will to give the reader a unique understanding of the subject and its applications. Contemporary approaches such as speech recognition using deep learning are also a very timely addition. This book would form an important reference text for undergraduate and masters courses in the field." "This constitutes an excellent introduction to the subject. The first chapters give a structured and comprehensive coverage of the core subjects necessary to understand the processing and analysis of audio: signal processing, acoustics, psychoacoustics, frequency analysis, and machine learning, all illustrated with MATLAB code. Throughout the book, important audio and speech applications are explored in detail, such as musical sound processing, speech coding, and wideband audio coding. I would thoroughly recommend this book as an excellent introduction to audio and speech processing for both undergraduate and postgraduate students." Dr Paul Hill received his B.Sc degree from the Open University (1996), an M.Sc degree from the University of Bristol, Bristol, U.K. (1998) and a Ph.D. also from the University of Bristol (2002). His research interests include image and video analysis, compression, fusion and multiscale transforms together with audio applications such as compression, retrieval and signal separation. He is currently a senior research fellow at the Department of Electrical and Electronic Engineering at the University of Bristol. He has taught the speech and audio processing course that the university for over 8 years and has supervised numerous audio MSc projects over that time. He has published over 30 academic papers and is also an amateur musician and composer often reflecting his passion for electronic music in his lectures and presentations.